How would you feel about youths being cheered by local media for going around a hard-hit area to clean graffiti and other damage done by vandals? What if you learned that those being portrayed as terrifically responsible, and taking the praise with gusto, were the same folk who committed most of the vandalism and tagging to begin with? 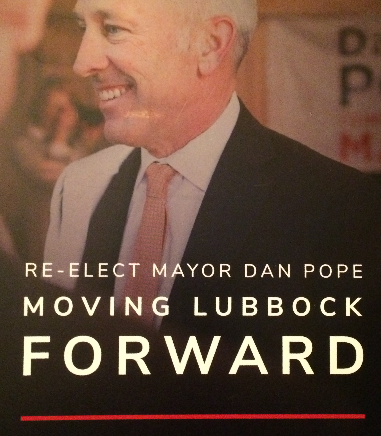 That’s a loose analogy to Lubbock Mayor Dan Pope and his guest commentary recently published in Lubbock. In it, Pope goes to great lengths to portray himself and the council as working to pay down debt so we can do the right thing and fund regular items with cash. “Lubbock is on a planned and deliberate path to both pay down existing general fund debt and reduce future debt issuances, which in the long term produces real savings for our residents. While this plan is working, the proposed legislation could create future debt problems,” his mayorship wrote setting up his criticism of pending property tax reform measures in the Texas Legislature. Interestingly in the mishmash of financial numbers Pope put in his argument against more taxpayer control of their own money, is that much of the debt he says citizens must endure big annual property tax increases to pay off, you know to be responsible and all, was created by him and the council by embarking on huge projects like a new city hall in a downtown high-rise and multiple new regional police stations. Pope and friends issued all of that massive debt without a vote of the people in a bond election. In other words Pope created much of the debt he says we can’t pay off if we get real property tax reform from Austin. In other words Pope created much of the debt he says we can’t pay off if we get real property tax reform from Austin. I think he made the case for why HB 2 and SB 2 should pass: local voters need a direct say in how much of their money is promised to others by folks like Dan Pope.